DVDFab Ripper Suite is a great bundle of DVD Ripper and Blu-ray Ripper. 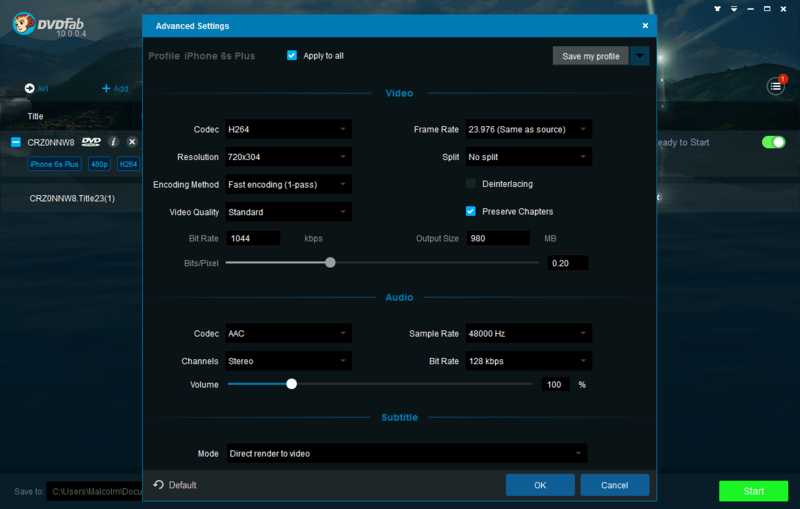 It's a standard bundle for converting DVD and Blu-ray movies to video or audio files for playback on mobile and portable devices, smart phones, tablets and other compatible devices. Really a powerful and amazing bundle! 1. DVDFab DVD Ripper is the best DVD ripper and DVD Converter that can rip DVD and convert DVD disc to popular file formats for many devices including iPod, iPad (iPad Pro), PS4, Xbox, cell phones and personal media players. It already supports iPad Pro and iPad Mini 4 now and works on the Windows 10. With user friendly interface, DVDFab DVD Ripper allows users to control over the output parameters easily. And it supports the newest NVIDIA CUDA, Intel Quick Sync, multi-core CPUs and batch conversion to increase speed. Like all DVDFab products, DVDFab DVD Ripper is designed to accommodate both new and experienced users with an interface that allows power and simplicity at the same time. 2. DVDFab Blu-ray Ripper now is enhanced to be able to rip any 3D Blu-ray to 3D videos besides ripping 2D Blu-rays to 2D videos. This ever stronger Blu-ray Ripper saves your energy, time, and money to do more jobs and deals with all your Blu-ray (2D & 3D) ripping issues, so that you can watch any Blu-ray on your 2D and 3D devices with the help from just one tool. It's easy and flexible to use, and is superior with fast speed and high quality. And it keeps being updated to always support the latest Blu-ray releases and new devices. 2018-05-10 10.0.9.2 1.Introduced the UHD Copy for Mac to back up 4K Ultra HD Blu-rays to BD-100 ISO files or folders.2. Introduced the UHD Ripper for Mac to convert 4K Ultra HD Blu-rays to lossless MKV/M2TS videos.3.Added the support to remove the Cinavia protections as found on the DVD versions of The Glass Castle.